Photography is all about light. 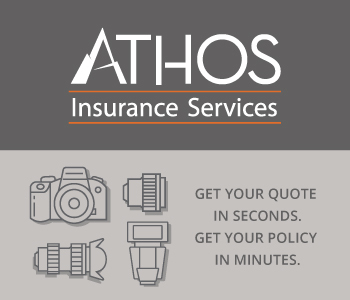 It is one of the crucial elements and it its quality will dictate the quality of the final image. Many photographers settle for ambient light simply because they are afraid or have no idea how to create their own light with flashes or continuous light sources. We are coming to their aid with a series of articles that are focused on the most popular lighting schemes used by portrait photographers and cinema people. 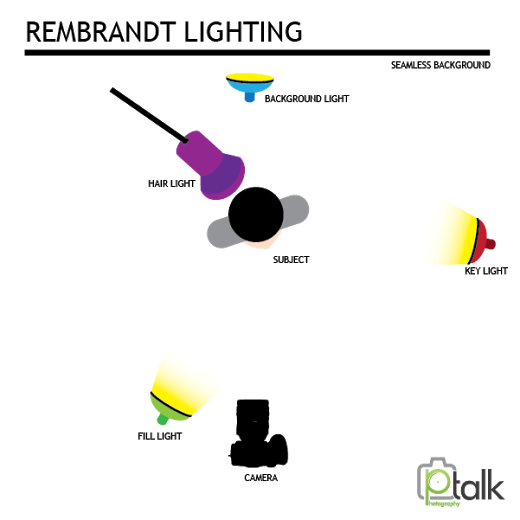 Let’s start with what is probably the most common scheme of all: Rembrandt lighting. As you might have anticipated, it was first “invented” by the Dutch painter Rembrandt. Its main characteristic is an illuminated triangle on the subject’s face on the less illuminated side . The beauty of Rembrandt lighting is that it can be made simple or complex. You can use only one key light, or more lights to add drama. In this scheme you can see a more complete version of the Rembrandt scheme. The standard key light position is around 45 degrees to the side of the model, but this can vary depending on the distance between the model and the light, the surroundings and so on. The fill light should be placed opposite to the key light, on the front, at half-height. If you don’t have a fill light, just use a normal reflector. The hair light is wonderful for giving a sense of volume and a nice contour. The background light is optional and it depends on the studio conditions. Ideally, the triangle on the subject’s face should be no longer than the nose and it shouldn’t be wider than the eye. As with any lighting scheme, it takes several tries to figure out the right distance and intensity. Another cool thing about the Rembrandt lighting scheme is the interaction between darkness and light. You might want to think about light modifiers. Rembrandt light is easier to create with softer light, and that means larger modifiers. Think about a large softobox or even an octobox for your key light. The hair light could be a bare strobe, set to minimum power. For the background light, a beauty dish is most likely the best option, but again, it really depends on the background. You could have luck with a bare strobe there as well. It’s very helpful to learn how to use Rembrandt lighting because you can use this scheme anywhere. Like I said, you can do it with only one flash or a reflector. If you don’t have a reflector with you, just use a piece of white plastic or a larger piece of paper. With this and all the other schemes that we will explain to you, it is important to explore them on your own, and not just apply the diagram. Each situation is different and getting the best result comes after trial and error. Have fun!